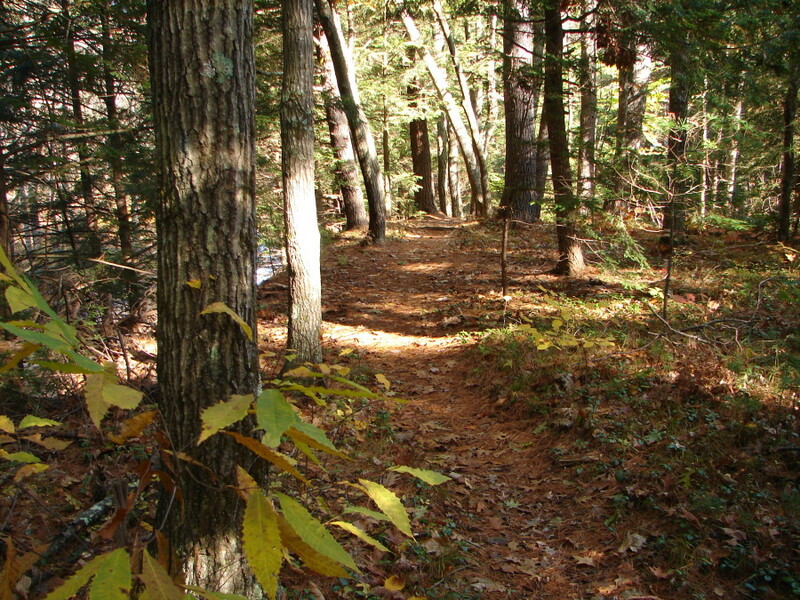 I originally wrote this piece in 2002 and it appeared in a somewhat different form in the now out of print magazine Outdoor New England. 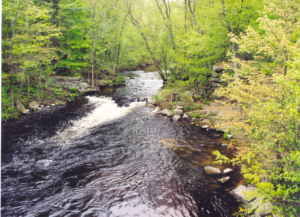 I love to spend time hiking and exploring the nooks and crannies of the Quinapoxet River that flows for approximately five and a quarter miles through Central Massachusetts between the Quinapoxet Reservoir in Princeton to the Wachusett Reservoir in West Boylston. It is a very ordinary river like hundreds of others that flow through every community in the United States. Actually part of what I love about it is that it is so very ordinary. Going there clears my mind and spirit. Most recently I have become fascinated with the sound the river makes. When I sit here to meditate I focus on the sound as at other times and places I focus on the breath. The most immediate discovery is that there is no one sound. As I sit at the small falls shown here it feels as though I am in a café and there are different conversations going on at each table. Each tete-a-tete has its own cadence, volume and pattern. It’s all incessant small talk coming from each spot. In one corner where the water swishes enthusiastically between two rocks there is a steady hiss that provides the background for the rest of the sound. In another corner of the falls the water pours over a rock and flows into deeper water. In this place there is a repeating splashing sound, a deep throated plunking and splattering. Right below my feet, there is a third sound a dripping distinct from the other tones but drowned out until I stop and listen intently. The river is singing in harmony. To hear all of these sounds I have to sit quietly and especially I have to calm the incessant inner static that often clutters my consciousness. The more I successful I am with this the more present I can be to the individual, particular vibrations as they over lap each other. Then I am reminded how wondrous even this plain, ordinary river really is. Within six feet of these falls the river swirls in several directions with a sound for each current. It forms a deep pool often frequented by fly fishermen. Here my image evolves into a symphony orchestra with each current being a different instrument section. What originally seemed to be one, unified and rather boring hiss becomes a truly interesting, complex phenomena. A sound from one section reminds me of a beautiful, resonant cello gracefully flowing through a series of deep resonant notes. The more I slow down and silent I become the more the more real, distinct and beautiful each instrument and section of the symphony sounds. In another place, a hundred or so yards down stream, the river gets wide and very shallow. 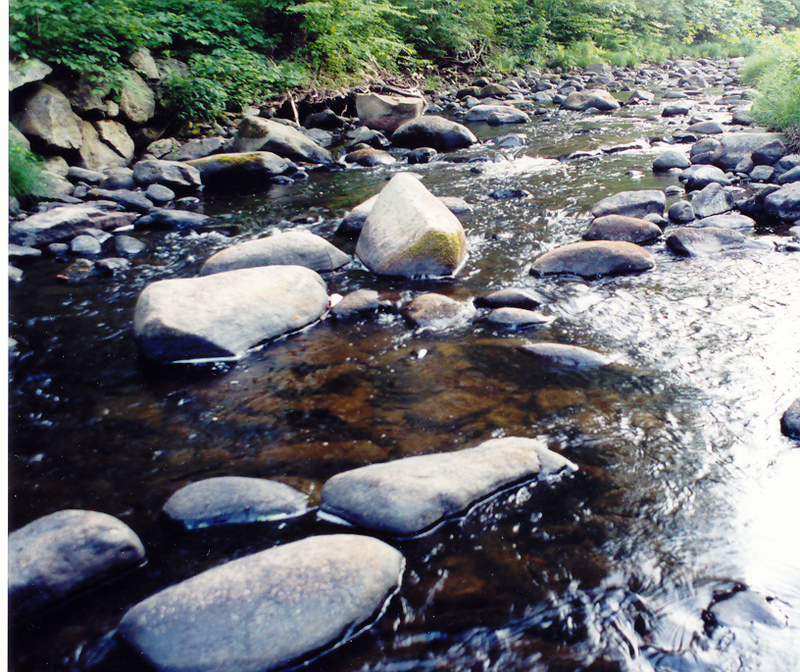 The water flows over a bed of rocks and boulders of various sizes. The sound here is shallow, tinny, higher pitched as the water scurries over the coarse, hard surfaces. There are numerous rat-a-tat-tats bantering back and forth seeming to mock the solemnity of the falls and pool. 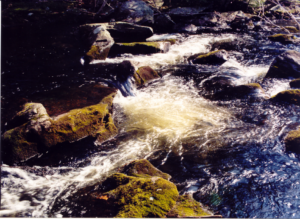 The river flows not only with water but also with sound. The sound is its song, liquid music flowing in a complex, syncopated rhythm with never ending variations within variations, within choruses, within movements. It has been said that for a poem to be fully experienced it must be heard. This is true also of a river. 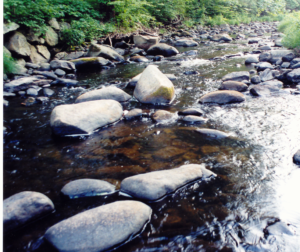 Dianne Ackerman, in her book A Natural History of the Senses, says that the word for poet comes from the ancient Aramaic word that denotes the sound of water flowing over pebbles. The poetry of this river is fully experienced as I stop, achieve a sense of inner and outer quiet and pay close attention to the simple beauty before me.